Itâ€™s the match up youâ€™ve been waiting for all season long. 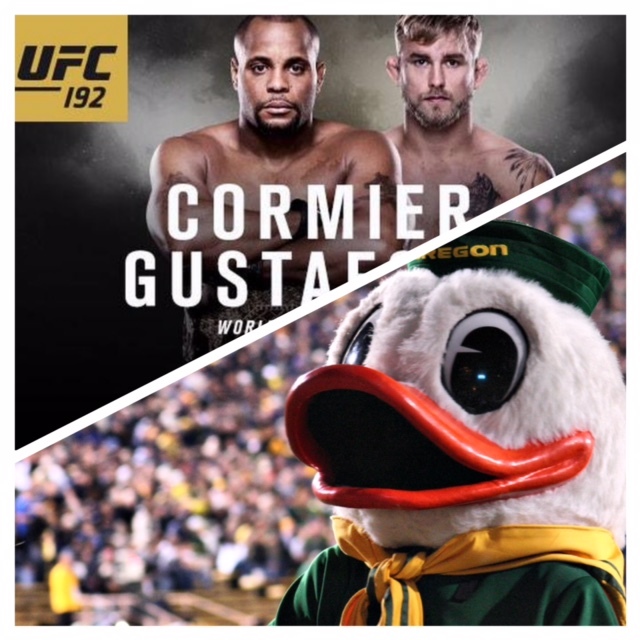 No, weâ€™re not talking about Cormier vs. Gustafsson, weâ€™re talking about UFC vs. The Ducks, and weâ€™re not sure which fans will take over more of The Hideaway this Saturday, October 3rd! First, weâ€™ve the UFC under cards which begin at 5pm, followed by the main card, Cormier vs. Gustafsson. Then, at 7pm, the Oregon Ducks play the Colorado Buffs. A $10 cover charge from 4:30pm â€“ 7pm gets you through the door for BOTH events. Donâ€™t miss this unprecedented match up!